Plitvice Lakes National Park is the oldest and largest national park in Croatia, covering an area of 73,350 acres. It was established in 1949. There are a total of 16 lakes in this national park along with approximately 90 beautiful waterfalls. The tallest waterfalls are Galovacki buk at 25 meters and Veliki slap at 78 meters. There are 12 upper lakes and 4 lower lakes. The lakes keep changing their color depending on the amount of minerals or organisms, as well as the angle of sunlight. The water turns blue or green due to the calcium carbonate from limestone rocks. Plitvice Lakes National Park is home to 320 different types of butterflies and moths and 150 bird species. In Croatian, this national park is known as ‘Nacionalni Park Plitvicka Jezera’. This national park has been designated as a World Heritage Site by UNESCO in 1979. It also encompasses the source of the river Korana which is located in the area surrounded by dense forests. Up until now, 1,267 different plants of 109 species have been documented here. On average, approximately one million people visit this national park every year. During the winter season, the temperature can drop low enough to freeze the water, including the waterfalls. The mountainous area which Plitvice Lakes National Park is situated in, is known as Dinaric Alps. These mountains provided foundations for the creation of the tiered lakes. The lakes are connected by walkways so that visitors can explore the area easily. Declan, Tobin. " 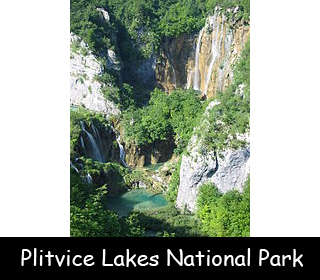 Fun Kids Facts about Plitvice Lakes National Park ." Easy Science for Kids, Apr 2019. Web. 25 Apr 2019. < https://easyscienceforkids.com/plitvice-lakes-national-park/ >.